This is a tiny doll I made from a pattern I designed using an antique lithograph doll.The pattern is two pieces with many darts. The face is hand painted. She has been traded to a new home. 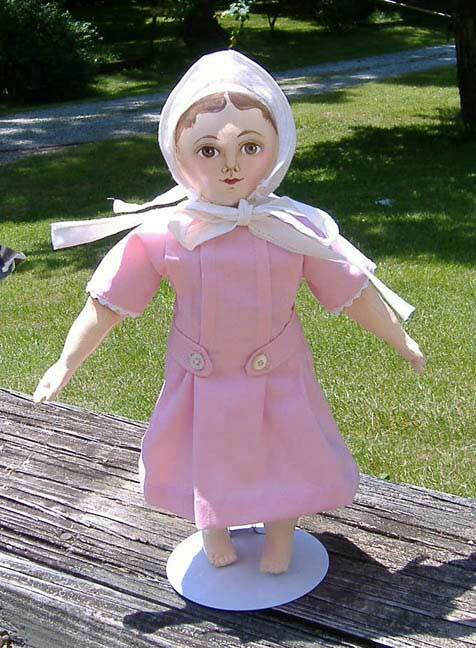 I received a wonderful child sized doll made by Kate Erbach which is constantly getting new clothes from the thrift stores. 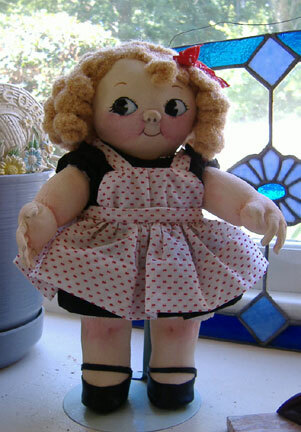 This is another reproduction Maggie Bessie doll made from my Bradley Justice pattern. Oil painted. 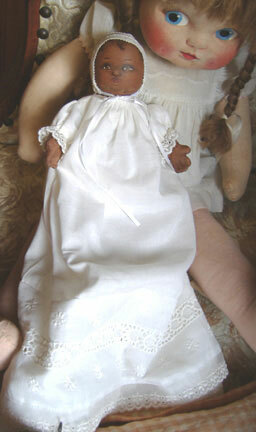 Doll made from a Barbara Willis pattern for my mother. Inside the box (which closes and hides under the skirt)are articles from my great grandmother given to my mother when she was 16. 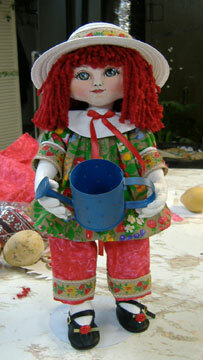 This is my Japanese Varie Doll made from felt. Her face is embroidered. She was a gift to my sister because she looks so much like her daughter Tiffany. Made at an Akira Blount workshop at John C Campbell Folk School. 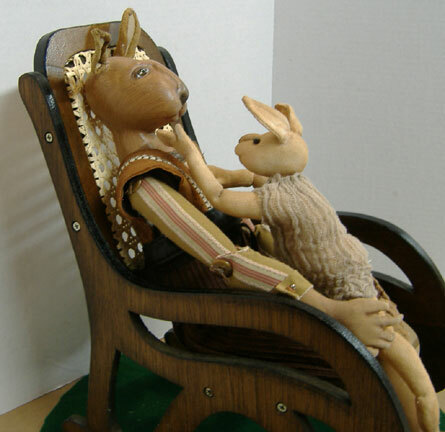 Dolls sit together as well. 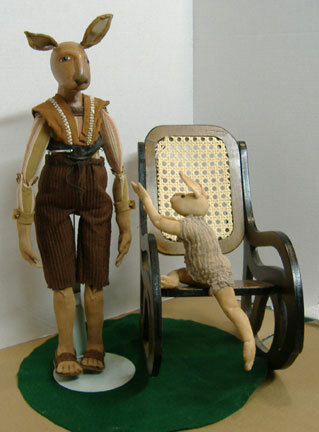 The group is called "Priority".The father rabbit has a ledger book which he puts aside in order to spend time with his child. 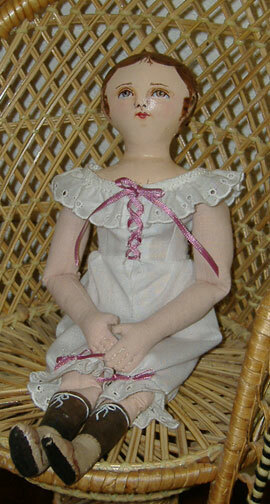 Sweet doll made from an old Better Homes and Gardens pattern. She was designed after a Mary Englebriegt illustration. I painted the face using a modern Mary Englebreight doll for inspiration. Here is a pattern I made from Kate Erbach. 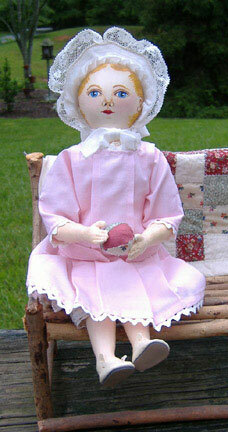 Her pattern is called Etta Mae and can be found on the Doll Journey website. 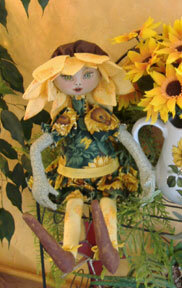 I turned her into a sunflower doll. 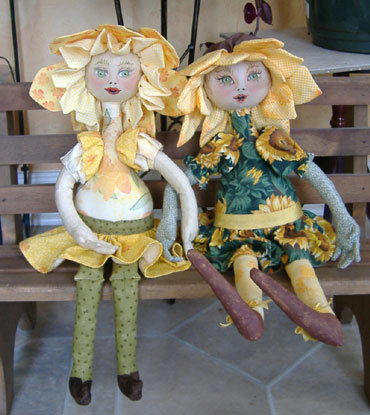 A friend like her so well she made a Daffodil doll. 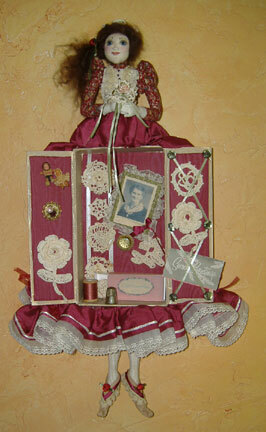 I am thinking of making a different pattern for different kinds of flower dolls now.